When evaluating exercise options for your back workout, there are plenty of options. But two of the most common are the bent-over barbell row and the T-bar row. Though very similar in form and function, there are a few fundamental differences. The barbell bent-over row is a popular, fundamental strength exercise that targets the muscles in your back using a barbell or dumbbells. 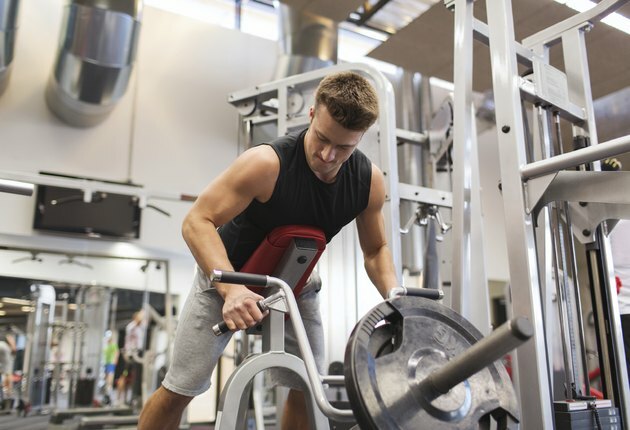 A T-bar row is a type of bent-over row done on a T-bar machine. Both exercises target your back muscles and have the same basic function, but each has its own benefits and drawbacks. To do a bent-over barbell row, stand with your feet about hip-width apart. Hold a barbell or a pair of dumbbells in front of your thighs with your hands slightly wider than shoulder-width and an overhand grip. Hinge your hips back and lean forward at a 45- to 90-degree angle, keeping your back straight. With your arms hanging straight down in front of you, bend your elbows, squeeze your back and pull the bar or dumbbells into your upper abdominal region with your elbows close to your body. Keep your weight evenly distributed over the four corners of your feet or even slightly backward. If your weight shifts forward during this exercise, it places excessive pressure on your lower back. The barbell row primarily targets the latissimus dorsi and trapezius muscles, located in your upper back. Using a barbell to train your back -- rather than a pulley cable, for example -- means your back muscles have to move the entirety of the weight rather than relying on momentum, the result of which can be greater strength and development. Using free weight also means you'll recruit more of your core muscles to stabilize your torso and keep your back flat. Inverted Row: Hang from a secured barbell on a Smith machine that's a few feet off the floor. Hang facing the bar and either keep your legs straight or bend at the knees. Bend your elbows and engage your upper back muscles to pull your chest up to the bar. One-Arm Dumbbell Row: Support one knee on a weight bench and plant the other on the floor. Bend at the waist and put some of your weight into the hand closest to the bench. Hold a weight in the free hand and let it hang from your shoulder. Bend your elbow and row the dumbbell up toward your chest, keeping your elbow close to your body. Standing Cable Row: Stand facing a cable machine and grab one of the handles at the level of your belly button. There should be tension in the cable but not too much. Using your upper back muscles, row your elbow and the cable back. Return the handle to the start slowly and with control. Seated Cable Row: Sit facing a cable machine with your legs in front of you, knees slightly bent. Grab the handle with both hands. There should be a slight tension in the cable when your arms are extended out straight. Bend both elbows to row the cable back toward your chest/stomach. Slowly return the handle to the starting position and repeat. The T-bar row is performed in the same manner as a barbell row, except you use a T-bar machine, which is a straight bar that attaches to a pivoting bracket at one end. The other end of the bar has handles for you to grab on a cross bar, which gives it its characteristic T-shape. The front end feature a portion of the bar that holds your weight plates. Stand over the bar near the handles so that the bar runs between your legs. Grab the handles and pull the weight up in the same manner as the barbell row. Lower back down and repeat. T-bar rows -- and almost all row variations, in fact -- work all the major muscles in your back. This primarily includes your latissimus dorsi, teres major, trapezius and erector spinae. Secondary to your back muscles, T-bar rows also work your shoulders and the pulling muscles in your arms -- biceps, brachialis and brachioradialis. Your abdominals, hamstrings and glutes must also fire to help stabilize your body in the bent-over position as you lift. T-bars come with wide grips -- palms facing either down or up -- and close grips, which position your hands close against the bar and emphasize lat engagement, since they keep your elbows close to your body. You can improvise a close-grip T-bar row by placing one end of an Olympic barbell into the corner of the room, then performing T-bar rows with the other end. What exercises do you rely on for your back workout? Do you prefer the barbell row or T-bar row (or another row variation)? Why? Share your thoughts and workout suggestions in the comments section below!